Take a moment to think about where you work. What has changed in the last 20 or 30 years? New equipment has probably affected how you do your job. Those technologies have advanced dental care, too. And if you live in or near Shorewood, IL, you can see some examples of this advanced dentistry at our office. Our team believes that our patients deserve the best care in the most comfortable environment possible. We can accomplish much of this through the training we have received and the compassion of our staff. But technology has advanced dental care thus helping us take it one more step for you and your family. Below, we will be discussing three ways we incorporate this technology into our practice. If you want to see it for yourself, call Shorewood Family Dental Care at 815-725-5991 or contact us online to make an appointment. Dental anxiety is a real concern for many patients. Some people are worried that dental care will be painful. And some have a more specific fear — the drill. We completely understand those concerns, and that’s part of the reason we have embraced laser dentistry at our practice. Dental lasers can be used for a number of reasons, and they can be used on both soft tissues and teeth. Let us explain some things lasers can do. ▪︎ Fight gum disease — Not long ago treating advanced gum disease required oral surgery. That meant cutting into your gums with a scalpel, and in the process, a dentist might remove healthy tissue just to make sure all the infected tissue was removed. Many times patients needed stitches after the procedure was done, too. With a dental laser, we often can treat gum disease without cutting into your gums at all. The laser evaporates infected tissue, which means we can save more healthy tissue at the same time. And since the laser seals the tissue, too, there’s less bleeding. You are less likely to need stitches, and your recovery time is shorter. ▪︎ Fix gummy smiles — Dental lasers can also provide cosmetic benefits. If your smile is more gum than teeth, we can correct it with our lasers. As with gum disease treatment, we can remove the unwanted gum tissue, which can transform your smile. ▪︎ Fight tooth decay — This is where “the drill” used to be part of the process. The drill made many patients uncomfortable over the years. With our dental laser, you don’t have to worry about that anymore. The laser can perform the same purpose — removing decay — without the high-pitched whizzing sound, the vibrations, or the pain. We know what some of you might be thinking? Isn’t an X-ray an X-ray? In one sense, yes, but digital X-rays offer multiple benefits for you as a patient. First and foremost, digital X-rays use a fraction of the radiation of the old film X-ray machines. That means less radiation exposure for you, your family, and our staff. If that was the only difference, that would certainly be a good reason to go digital. The thing is, that’s only one of the benefits of digital X-rays. Digital images can be seen almost instantly on a computer. This allows us to look at them like we would with a standard X-ray. It also allows us to zoom in to take a closer look at potential problems and to share those images with you to explain what is happening in your mouth. We’ve found that when patients can see what we are discussing, it makes it easier for everyone to understand what needs to be done. Cone beam technology allows us to create three-dimensional images of patients’ mouths and jaws. In a matter of minutes, this machine captures hundreds of images from every angle. Using computer software, those images are compiled into a 3D representation of your mouth. This allows us to diagnose problems earlier, and it helps us plan restorative procedures like dental implant placements. 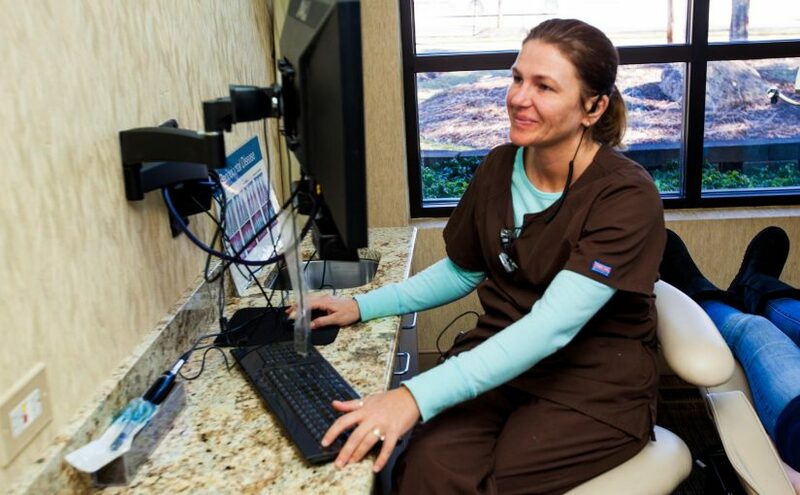 When we add new technology at Shorewood Family Dental Care, we are making an investment. This investment pays off by allowing us to do more to keep our patients’ mouths as healthy as they can be. And we know from experience that people with healthy mouths tend to smile more, too. To see our technology in action, fill out our online form or call 815-725-5991 to make an appointment soon.